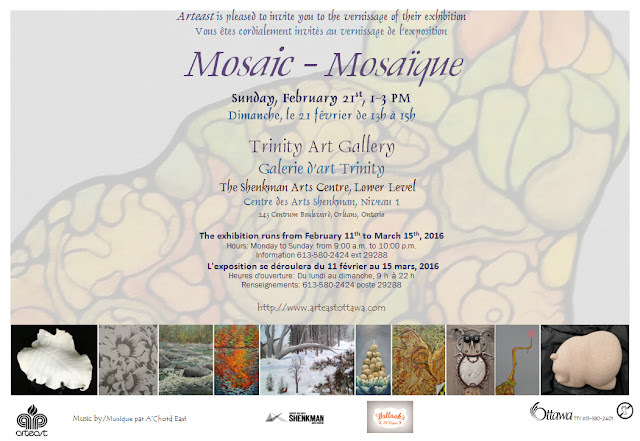 The public is invited to the opening of Arteast's latest juried show, “Mosaic”. The reception takes place on Sunday, February 21st 2016, from 1-3 p.m. in the Trinity Gallery on the Ground Floor of the Shenkman Arts Centre, 245 Centrum Blvd. in Orleans. This exhibition brings together more than sixty recent artworks in various media by Arteast members. Chosen by a panel of jurors these pieces, seen together, are no longer isolated artworks but a unique reflection of the membership: the ‘mosaic’ of Arteast. Le public est invité au vernissage de l’exposition avec jury appelée ‘Mosaïque’. La réception aura lieu le dimanche 21 février 2016 de 13 à 15h à la Galerie Trinity , Niveau 1 du Centre des Arts Shenkman, 245 boul. Centrum à Orléans. The public is invited to an opening reception for ‘Winter Medley’ - the latest show to be presented by Arteast. 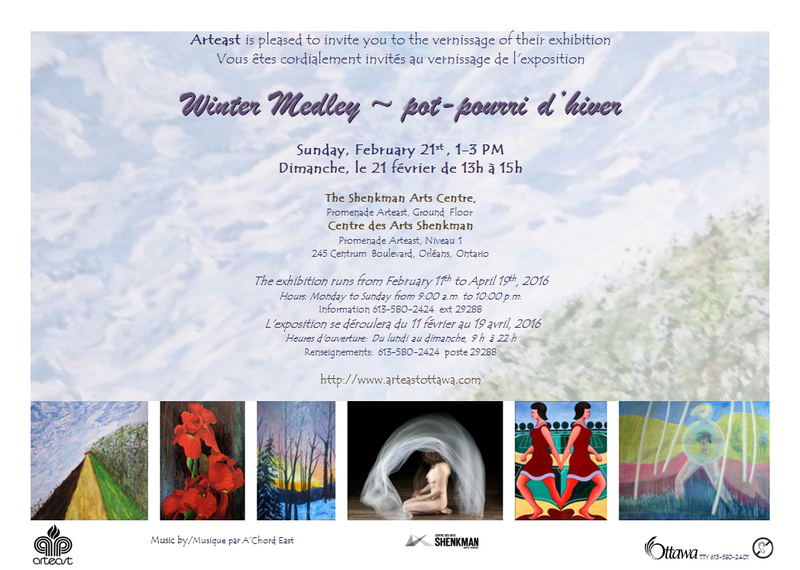 The reception will take place on Sunday, February 21st, from 1:00 p.m. to 3:00 p.m. on the ground floor of the Shenkman Arts Centre, 245 Centrum Boulevard, Orleans. Le public est invité au vernissage de l’exposition « Pot-pourri d’hiver » présenté par les membres d’Arteast. La réception aura lieu le dimanche 21 février 2016, de 13h à 15h au niveau 1 du Centre des Arts Shenkman, 245 Boulevard Centrum, à Orléans. Arteast est fière de présenter les diverses œuvres de ses membres où on y trouve plusieurs sujets, styles et médiums. Que ce soit des artistes de la région ou de provenances diverses, la qualité et la variété de ses œuvres enrichissent la communauté artistique d’Ottawa. Il y a une histoire derrière chaque œuvre unique; elle est représentative de l’expérience, du vécu et du talent de l’artiste! Creations Cumberland will have a weekend art gallery on Feb. 20-21, Saturday 10 am to 4 pm, Sunday 11 am - 4 pm in the beautifully renovated Haddad S&S Foodliner, 2565 Old Montreal Road, Cumberland, ON. The event will showcase a wide variety of paintings, photography, sculptures and fine craft including folk art hooked rugs, stained glass, needle felting and other unique items by local artists. Arteast members Susan Ashbrook, Janis Fulton, Hélène Martin, and Kerstin Peters are part of this event. The vernissage will be held on Friday, February 19 from 7 pm to 9 pm. For more information please go to https://www.facebook.com/groups/CreationsCumberland/ or http://www.creationscumberland.ca/.